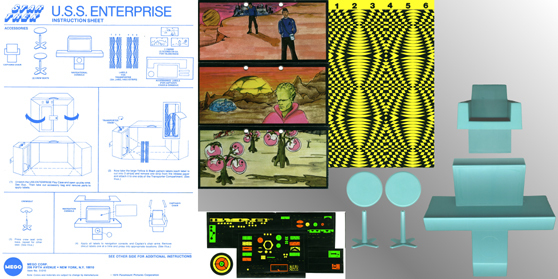 Mego released the Enterprise as a Gift set that included the first five figures. The U.S.S. Enterprise Action Gift Set (Item No. 51217), one of the rarest “Trek” items out there. This playset poses a real source of confusion for the Mego collector. There are so few of these sets out there that we will probably never know everything about its manufacture. When talking about this piece, you have to enter into the realm of probability and deduction, rather than cold, hard information. The first problem with this set is that, aside from the outer box, it is identical in every way to a standard Enterprise Playset (even the Item No. printed on the playset itself is still 51210). Obviously, this means that assembling a loose specimen of this Gift Set is a snap, since all you have to do is add five figures to a loose playset, and there you go. The problem arises, however, of original manufacture intent. Since most children receiving this item would have trashed the outer box, it is now impossible to speculate on exactly how many of these sets were produced. I mean, how many loose Enterprises out there began their life as a Gift Set? We’ll never know. The only thing really required to assemble a mint-in-box Gift Set are the following: a mint-in-box standard Enterprise Playset (with accessories still bagged and labels unapplied); five standard Mego clear plastic “figure baggies” (the kind that come with catalog mailer boxes); a loose Kirk, Spock, Bones, Scottie and Klingon (all on Type 1 bodies); and the Gift Set box itself (obviously the hardest component to locate). Now, let’s discuss the fact, theory and conjecture surrounding this item. What, really, do we know for sure about the Gift Set? Not much… * Did the Gift Set come with “blue” accessories? Definitely. The playset that I acquired mint-in-box came with the “blue” set of accessories. It was purchased from the original owner, and this owner had never had another Enterprise Playset in his possession, and, as such, I have no reason to suspect him of “swapping” accessories. * Did the Gift Set come with “mixed” accessories? Possibly, though doubtful. The Gift Set, no doubt, was only available for an extremely limited time, and it is improbable (but possible) that it was made available with the “mixed” accessories. The reason it is doubtful is this: if the difference in accessory sets was due to time of manufacture, it is highly unlikely, due to the limited timespan of its manufacture, that it had the opportunity to bleed over into “mixed” set inclusion. Inversely, if the difference in accessory sets was due to different manufacturing plants having different materials available to cast the accessories, then it is still unlikely, since it is doubtful that an item of such limited release would have been assigned to more than one manufacturing facility. It is worth noting, however, that the television commercial for the Gift Set pictures a playset with “mixed” accessories. This fact should be taken with a grain of salt, however, since the commercial probably featured a prototype of some kind, as many of Mego’s commercials did. * Did the Gift Set come with Type 1 figures? Definitely. All evidence available agrees with this. The Gift Set box features Type 1 figures in the photograph, the commercial features Type 1 figures, and the fact that only the five male figures are included suggests that Uhura had not yet been released. Any “Trek” crew members released before Uhura would have been on Type 1 bodies only (this is further evidenced by the picture of the Enterprise on the back of “6-face” cards, which features an Uhura figure among a crew comprised solely of Type 1 bodies). * Did the Gift Set come with Type 2 figures? Extremely doubtful, almost to the point of “no.” This set almost certainly did not see a long enough span of manufacture to have bled over into Type 2 inclusion. * Was the Gift Set a Canadian exclusive? Almost certainly not. Canada, along with France, got a smaller Enterprise Playset (about 10% smaller) for distribution, along with a smaller, bi-lingual box. It is doubtful that two Enterprises of conflicting sizes were released in the same country. * Did the figures that came with the Gift Set come in catalog mailer boxes? Simple physics would suggest “no.” There is no way that five mailer boxes could fit into an Enterprise Playset, along with all of the accessories. It is more likely that they just came bagged. There’s not much more to say about this piece that is not covered in the entry for the standard Enterprise Playset. 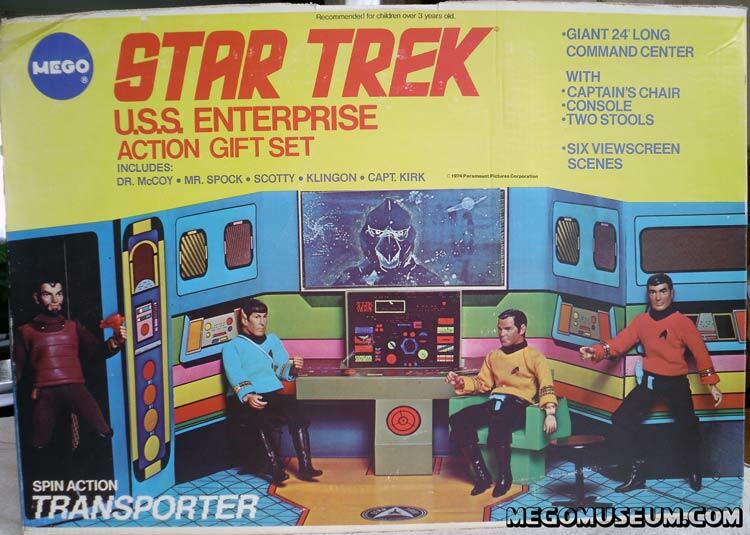 There is one more fact worth noting: the box for the Gift Set, in the list of included figures, denotes the chief engineer as “Scotty.” This is the only time in the eight-inch line that Mego ever spelled his name correctly!